With just a single engine derivative, the Mercedes-Benz C Class Cabrio doesn’t offer a whole lot of choice for non-AMG buyers – there are 3 of those. 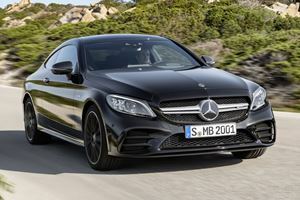 A 2.0-liter turbo delivers 241hp in C300 guise. A 9-speed automatic gearbox is standard, and drive can be optioned between rear- and all-wheel drive. 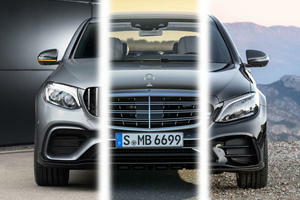 An AMG-line package adds sculpted exterior trim, and sportier interior trim, without the full burden of an AMG model. Optional safety equipment includes adaptive cruise control, blind spot monitoring, and active lane keep assistant. 2 years after the introduction of the W205 Mercedes-Benz C Class, and in time for 2017, Mercedes has dropped the soft-top on the most stylish of the C Class range. Based on the C Class Coupe, the dimensions are near on identical. 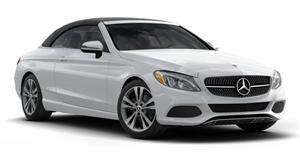 The soft-top roof – derived from the S Class Cabrio’s – takes 24 seconds to open or close, at speeds of up to 31mph. With a range of models, including three AMG derivatives and a choice between rear- and all-wheel drive, the C Class Cabrio caters to a wide range of style-minded buyers. Much like the Coupe and Sedan, the C Class Cabrio’s interior design was handled by the brand’s Italian design studio. As such, it gets the same aviation-styled air vents and controls, the same gorgeous steering wheel that’s delightful to grip, and the same annoyingly obnoxious infotainment screen that stands almost free from the dash like an afterthought iPad. The materials are for the most part very premium, though the wood veneer finish feels tacky, and some trim edges feel scratchy and unfinished. Front occupants will find very comfortable seating arrangements, though for those in the rear things are somewhat less commodious. Sure, head room is ample with the roof down, but it’s only suited for shorter occupants in the leg room department, and when the roof is closed. With the roof up trunk volume is 12.5 cubic feet, but with the roof open, that figure drops to just 9.2 cu ft. The C Class Cabrio is the more style-orientated of the C Class family. The suspension loses much of its rigidity, despite additional strengthening to counter this. As such, it loses any incisiveness it usually has for spirited driving. The ride quality on standard steel springs is lumpy and overwhelmed a little by weight, so the best option is the optional air suspension. With this equipped, the ride is soft and cushy, absorbing bumps and ruts with ease. But the air suspension in comfort mode is prone to plenty body roll, and over larger bumps a bouncing, porpoising motion. With the air suspension, DYNAMIC SELECT allows the suspension to be stiffened substantially in Sport mode – but if you’re using that, you’re missing the point of the C Cabrio. The steering also adjusts in different drive modes, but still feels numb, albeit responsive and linear in its responses. AMG models aside – we’ve dealt with those in a separate AMG review – C Class Cabriolet is offered in the USA with just one engine derivative. The C300 packs a 2.0-liter turbo inline 4 cylinder with 241hp and 273 lb-ft of torque. Torque is readily available from as low as 1300 rpm, allowing for a 0-60mph sprint time of 6.3 seconds, whilst economy is rated by the EPA at 22 mpg in the city. A 9-speed automatic is standard, sending power to the rear wheels; though the option of 4MATIC all-wheel drive is available, utilizing the same engine and gearbox pairing. Standard equipment includes leather upholstery, and the AIRCAP diffuser for quieter top down cruising. But there are a range of packages to choose from that add extra equipment, including park assistance, interior lighting, lane keep assist, 360-degree camera, and AIRSCARF to keep your neck warm in winter when the top is down. Safety features include optional DISTRONIC adaptive cruise control with active lane keeping and blind spot monitors, as well as ABS and stability control. The C Class Cabrio hasn’t been crash tested, but a sedan model returned as an IIHS Top Safety Pick, and scored 5 stars in NHTSA testing. Stylish and, with optional air suspension, comfortable, the C Class Cabrio is a relaxed alternative to its sedan and coupe siblings. 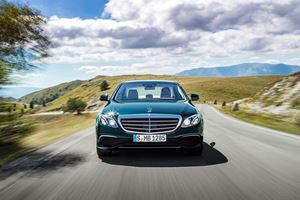 With just one engine available, buyers could be wanting more choice, but the C300 is still mighty impressive, and worth a look for buyers hungry for a convertible of this size. After recent rumors revealed the idea. The facelifted C-Class Coupe and Cabriolet will debut at the New York Auto Show next week.